The ‘cog wheel’ button (in the upper right corner of a widget) will open a pop-up window that allows you to change the options for the widget. Option changes are automatically saved to the WebUI Server. There you can drag-and-drop the indices to the different areas in your widget. E.g. 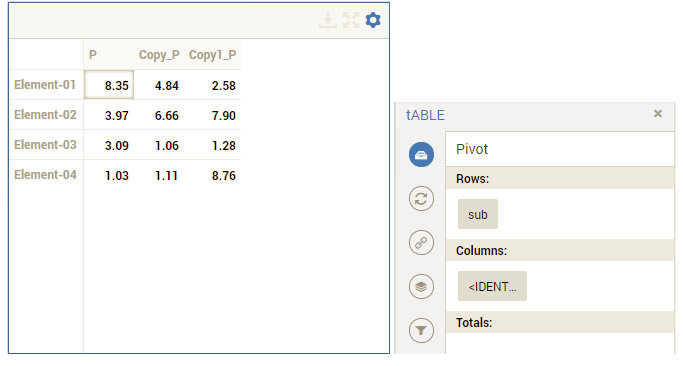 in case of a Table widget, to the Rows, Columns or Totals area. You can use all kind of widgets to display your AIMMS data. By changing the type of a widget, you can easily switch between e.g. 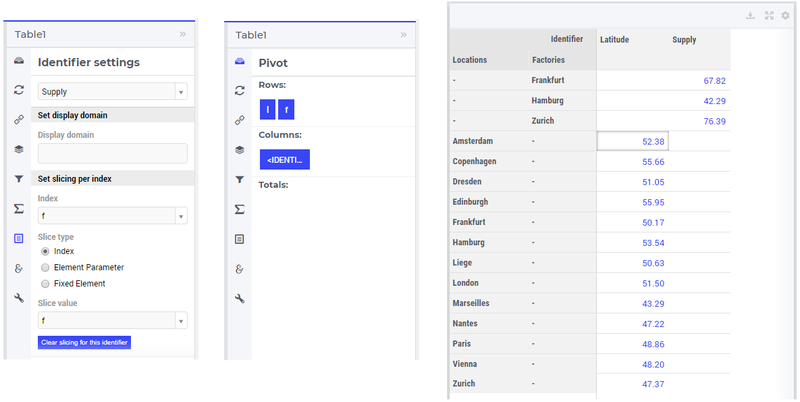 a table or a chart, without creating a new widget for that. To do so, you should open the widget options of your widget and go to the Change Type tab. There you will see the possible types to which you can switch. Some WebUI widgets offer you the possibility to store the (combination of) element(s) that currently have focus in the widget. E.g. in the Table widget you can store the focus cell, in the Bubble chart widget you can store the focus bubble. In WinUI you have similar functionality like this, called ‘Reverse Link’. Specifying the Store Focus option opens up all kinds of interactive opportunities. E.g. by changing the focus cell in a table, other widgets could display relevant information for that specific cell. At the Store Focus tab in the widget options you will see a list of indices. For each index you can specify the element parameter that should be filled with the element that has the focus in the widget. The list of indices also includes an index referring to IDENTIFIER-SET. You can specify an element parameter over the set AllSymbols there. This allows you to also store the identifier that currently has focus in the widget. This could be relevant when you display multiple identifiers in your widget. 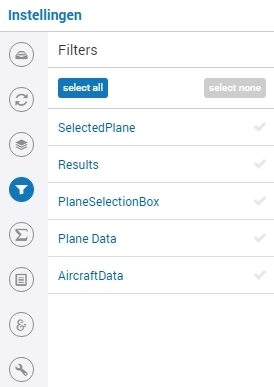 At the Contents tab of the Widget Options, you can specify for which AIMMS identifier(s) the widget should show the data. You can change the Current Contents by searching for a specific identifier at Available Data. By clicking on the identifier, it is added to the Current Contents list. In case only one identifier is allowed for a specific widget, adding another identifier will delete the previous identifier from Current Contents. If multiple identifiers are allowed in a widget type, adding an identifier will extend Current Contents. You can delete an identifier from Current Contents by clicking on the cross on the right of it. You can re-order the identifiers at Current Contents by drag-and-drop, or by clicking on the triangles in front of the identifier. 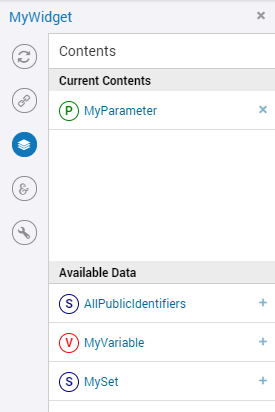 In case you cannot find the identifier that you are looking for at Available Data, you might need to make sure that the identifier is in the set AllPublicIdentifiers. X_annotations to hold annotations that are put as CSS classes on associated DOM elements in your model. See the Data-Dependent Styling section for more details. X_flags to make updatable identifiers appear as read-only in the WebUI. See the Data-Dependent Styling section for more details. a procedure with two input arguments, both with the same domain as the identifier X. The first argument should be a numeric parameter, and will hold a 1 for each tuple that was changed. The second argument should have the same type as the X and will hold the old value for such a tuple, the changed value can be obtained via X. In the above example, X and OldValue should have the same type. The latter form can be used, for instance, to detect which tasks in a Gantt chart has moved, or to act upon a block edit in a table. X_text to hold additional text to be shown within the DOM element associated with a data tuple. This option is currently only supported by the Gantt chart. The CSS classes defined via the annotations identifier of the identifier X itself will also be set for text displayed in the associated DOM element. You can use this, for instance, to change the styling of the displayed text of elements you want your end-users to pay extra attention to. For the Gantt chart, you can set CSS for the task text via .tag-ganttchart .label, possible compounded with the additional CSS classes set via the annotations identifier of the <duration> parameter. Besides the simple text-based tooltips illustrated above, one may also use HTML-based tooltips, which allow to display more sophisticated contents when hovering over the data entries in a widget. 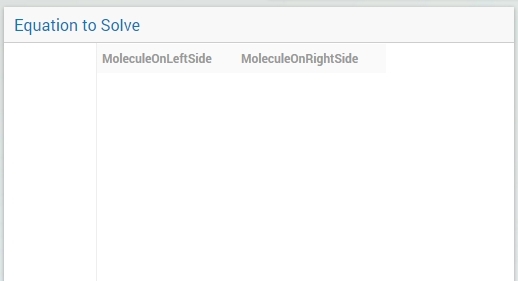 In this case the data of the string parameter X_Tooltips (associated with an identifier X) must be in HTML format; for more info on HTML, see for example html.com or www.w3schools.com . Next we illustrate this feature based on some concrete examples for various widgets. Using HTML format: Where in a simple text-based tooltip you used \n to move to a new line, in a HTML-based tooltip this needs to be replaced by <br>, see example above. Similarly, the usage of \t in text-based tooltips should be replaced by HTML tables, see further below. 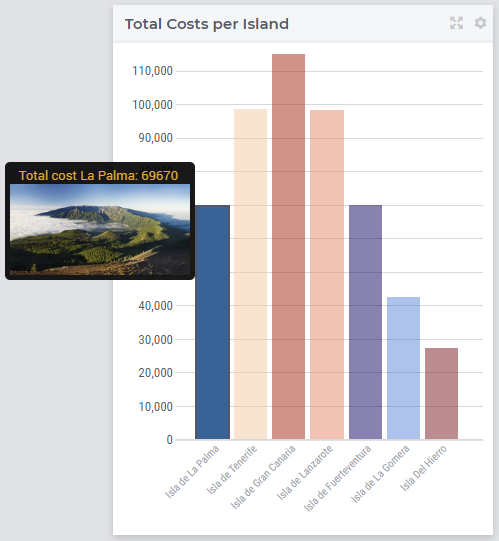 Using Application-Specific Resources: By using a string of the form “/app-resources/resources/images/Canarias.png” like illustrated in this example at hand, one may refer to an image included in the resources/images subfolder of the WebUI folder of the application directory. 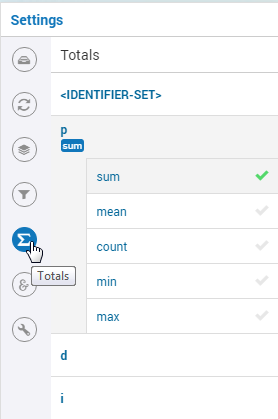 If you do not want to show the default tooltips for certain identifiers or data items, you can make this possible by clearing or emptying the data for the respective identifier or data point in the _tooltips identifier. For example, consider the below table. You do not want to show the tooltip with the same value as the cell value, or if the value of a cell is 0. In the _tooltips identifier, just clear/empty the data for these specific cases that you desire to hide the tooltip for. The feature to hide tooltips is available only in AIMMS releases from 4.65 onwards. 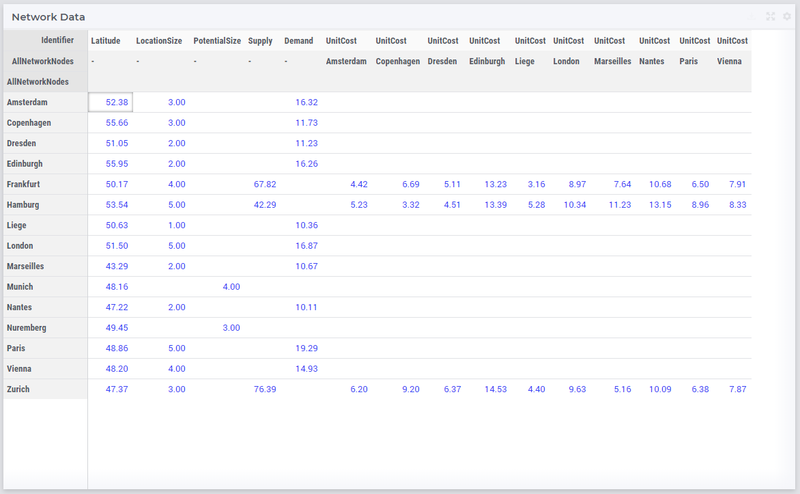 The WebUI widgets offer the possibility to specify one or more filters for their data. These filters are widgets as well. Widgets that can be used as filters for other widgets are the Multiselect widget, the Selectionbox widget, the Legend widget and the Table widget. In the filter dialog displayed in the image above, the widgets that can act as a filter and which are on the same page as the current widget, are listed. You can select the ones that you want to use as a filter for the current widget, by clicking on them. 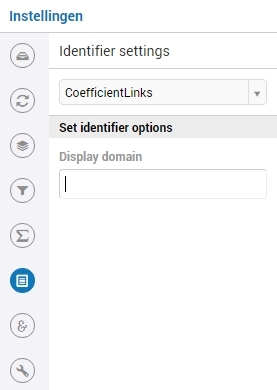 Obviously, the contents of the widget used as a filter should at least contain an index which matches an index in the content of the widget to be filtered in order to yield any effect. The Selectionbox widget used as a filter acts about the same as using a Multiselect widget. The one-dimensional parameter which serves as the content of the Selectionbox, will filter the data in your widget just as in the Multiselect case. In this case, though, your widget will only display data for the one value that you select using the selectionbox. Using a Legend widget as a filter is similar to using a Selectionbox widget. It also restricts the filtered widget to display data for exactly one value that you select in the Legend widget. The Table widget is a slightly more complicated widget type to use as a filter. It restricts the filtered widget to only display data for which the corresponding identifier(s) in the Table widget show(s) data. 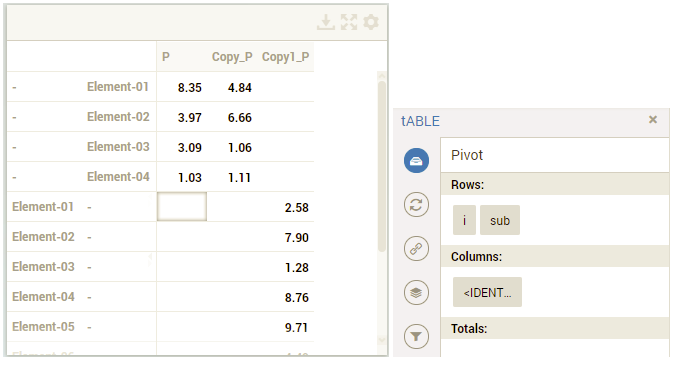 This means that, in case you display sparse data in your Table widget, those columns and/or rows which only contain default values in the Table (and are thus not displayed), are also filtered out in the filtered widget. 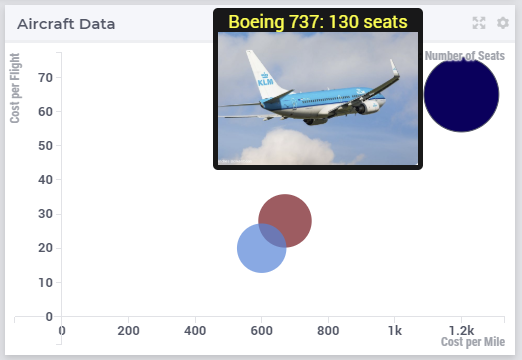 So, suppose you show a bar chart with data for certain aircraft types, which is filtered by a table that only contains default values for a certain aircraft type, the bar for this particular type will also not display in the filtered widget. It is possible to combine filters as well. You can just select more than one filter for your widget. Of course, it depends on your specific widgets what effect this has on the filtered widget. For each index in your widget, you can turn on several aggregators, like: sum, mean, count, min, max. Adding these totals will result in extra data in your widget. In both AIMMS and the WebUI, the data is displayed in a sparse manner by default. 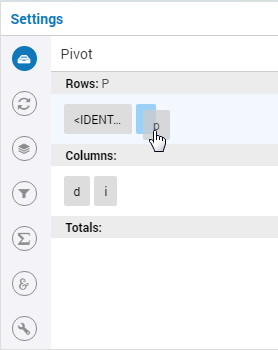 In the WebUI, this means that, for example, a Table widget showing an identifier that has a complete row or a complete column with only default (0) values, does not display such a row or column at all. When merely displaying your data, this is usually convenient, but if you want to edit your data, it becomes hard if the row/column that contains the default (0) value that you want to edit is not displayed at all. For such situations, it makes sense to display the data in a dense way. Specifying no value at all (the default situation) means that the identifier displays in a sparse way, i.e. only the rows/columns containing non-default values are displayed. Specifying a value of 0 means that the identifier displays nothing at all. Specifying a value of 1 means that the whole identifier will always be displayed, even if it only contains default values. You can obtain a more fine-grained level of control by specifying an identifier which contains a sparsity pattern. To illustrate the above, here are some examples that show the difference between all usages of the display domain, applied to the same table. 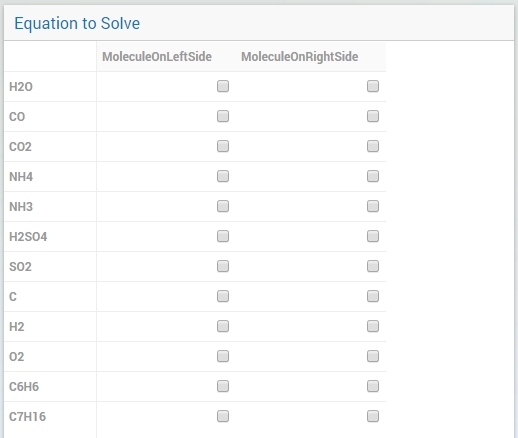 This table contains two columns and a number of rows containing checkboxes. 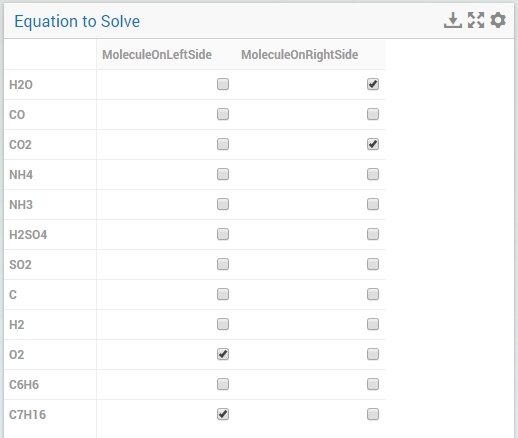 As expected, this table only shows the rows for which the molecules contain an O in their name, regardless of the value of their associated checkboxes (note the non-displayed row for the C7H16 molecule!). Specifying an identifier for the display domain is the most flexible way of determining the display domain. You can also use it to only display a slice of a displayed identifier, by only setting the associated display domain identifier to 1 for a specific value of one of its indexes. Please be aware that if you specify an identifier here which is defined over a subset, you should define the display domain identifier over the same subset (and not the master set). Identifiers in AIMMS can have multiple dimensions. You can specify these dimensions in AIMMS via the index domain of an identifier. These identifiers can be displayed in the WebUI and their data is shown over all these dimensions by default. However, there are also cases where you only want to see part of the dimensions/data. In situations like this, you can slice the indices of one or more identifiers in your widget. This can be done by the ‘Set slicing per index’ option at the Identifier Settings tab of the Widget Options. On top of the Identifier Settings tab, select the identifier that you want to slice. 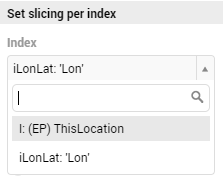 At ‘Set slicing per index’ you select the index that you want to slice (every index can have its own slicing). Specify the ‘Slice type’ that you want to apply for this index. Specify the corresponding ‘Slice value’. Index - You can slice the selected index to another (related) index. At ‘Slice value’ you can then select from all indices that have the same rootset. Slicing to a different index is useful when you e.g. only want to see a subset of the elements of the original identifier, in which case you would slice to an index of a subset of the original index. 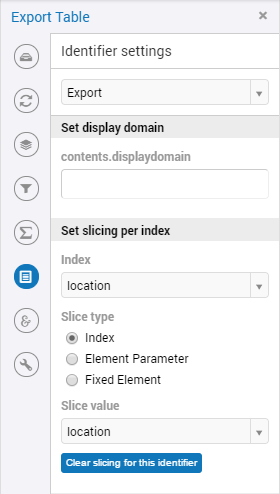 Element Parameter - You can slice the selected index to a (related) element parameter, which you can specify as the ‘Slice value’. The selected index is then fixed to the current value of the selected element parameter. 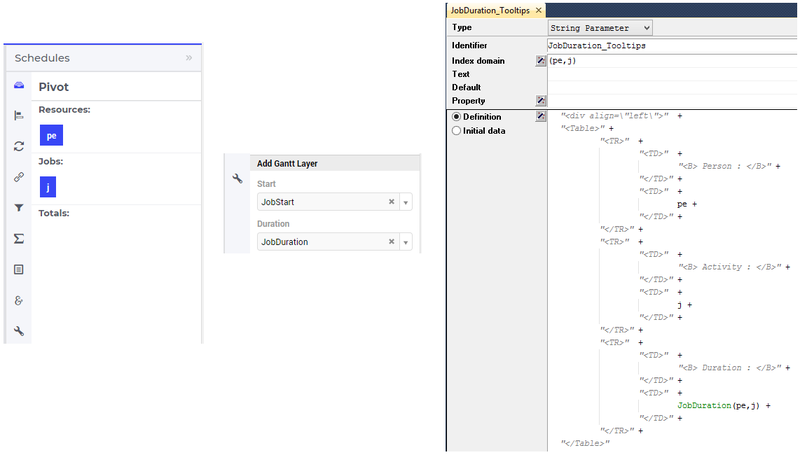 The widget will show the data of the identifier, only for the element in the element parameter for the selected index. Fixed Element - You can slice the selected index to a fixed element, which you can specify as the ‘Slice value’. The selected index is then fixed to the selected literal element value. The identifier data will only be displayed for the selected element for the selected index. When selecting an index in the index selectionbox, you can also see an overview of how all the indices in your widget are sliced. E.g. in this picture, you can see that there are 2 indices, both sliced. The first index, l, is sliced to the Element Parameter (EP) ‘ThisLocation’. The second index, iLonLat, is fixed to element ‘Lon’. To easily clear the slicing of an identifier for all its indices, you can press the ‘Clear slicing for this identifier’ button. Of course you need to make sure that you have selected the identifier for which you want to clear the slicing in this widget. Some of the widgets require multiple identifiers as input (contents). When you slice one or more of these identifiers, you need to make sure that the resulting index domains match. Whenever you slice one dimension (index) of an n-dimensional identifier to a fixed element or element parameter, its dimension will become n-1. This is good to realize, as some widgets require identifiers of a certain dimension. E.g: In the map widget, the arcs identifier needs to be two-dimensional over the set nodes x nodes. Whenever you slice one dimension to a fixed element (or element parameter), you effectively loose a dimension and it becomes impossible for the map widget to map data to arcs. As a work around you can consider to create a set containing a single element and use subset slicing here: whenever you do subset slicing, the dimension of the data that is displayed, is not reduced. The transport table is not sliced. All non-default data is displayed. The transport table is sliced to show the transport from a single selected factory (via element parameter) to all locations. The transport table is sliced to show the transport from all distribution locations (subset with index distr) to the fixed location (fixed element) ‘Breda’. The feature described in this section (and in the Example underneath) is available only in AIMMS releases from 4.62 onwards. In some situations, some identifiers may be declared in the model over some super-sets and other identifiers may be declared over some sub-sets of those super-sets. However, it may be beneficial to show all the data of several such categories of identifiers in the same widget, for example in a table widget. 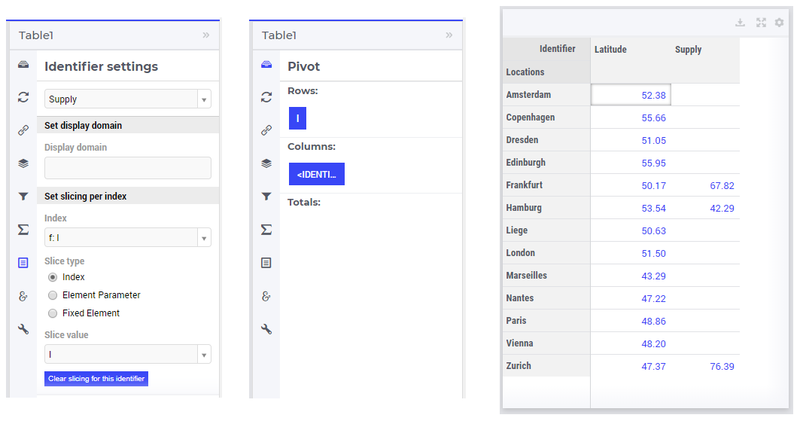 If all indexes involved are used as separate indexes in a widget, then they are treated as “independent” in the Pivoting section and the resulting layout of the data in the widget may not be an “intuitive” one. However, such a layout may not look “intuitive”, because the set of Factories may be regarded more naturally as “contained” in the set Locations, instead of as an “independent” set. In such situations, it is possible to expand an index to a super-index, that is, to an index in a super-set of the initial index set. Such expanding may be achieved through the same options in the widget editor which are used for slicing, as explained above. However, in this case an identifier may be rendered over a larger domain than its declared domain and some “values” may be just empty, i.e. flagged as “outside-domain”. When an index has been expanded to a super-index, it will no longer be treated as a separate index in the Pivoting section, but rather as “contained” by its super-index. Please note that, like slicing, the index expanding is also applied per each identifier specified in the widget Contents. Note that, in this case the cells of the column Supply which are outside domain are simply empty and not editable. The index expanding may be involved in more complex data layouts as illustrated by the example in this section. So, in this table all the data of the above mentioned identifiers is shown together, while the Pivoting section of the table only consider 2 indexes instead of the 5 original indexes used in the model declarations. All the cells which show no value are simply empty (“outside-domain”) and not editable in the table. There are situations where you may want to hide certain widgets for certain users. Especially if many ‘roles’ can be identified among the users of your applications, this may apply: for some users, data displayed in a particular widget is of no interest, while for others it is. To help you in situations like this, every widget has an option called Visible, located on the Miscellaneous tab in its option editor. Setting this option to False (or 0) has the effect that the widget is not visible anymore. 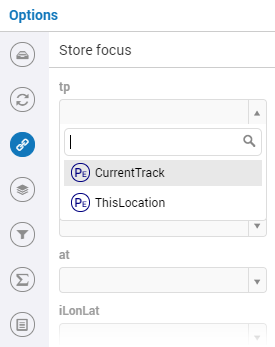 In order not to lose track of these widgets while developing your WebUI, there is an ‘eye’ icon in the top bar, with which you can still show the hidden widgets. These are displayed in gray, in order to distinguish them easily from the visible widgets. This icon is not visible when running your WebUI app in a PRO environment (i.e. in the end-user scenario), or when you have no widgets that have the Visible option set. to make sure that only finance people and people from the management can see one or more specific widgets. Please note that if you want to make sure that not all your users can see all available data (e.g. because some of it is confidential), hiding certain widgets is not sufficient. 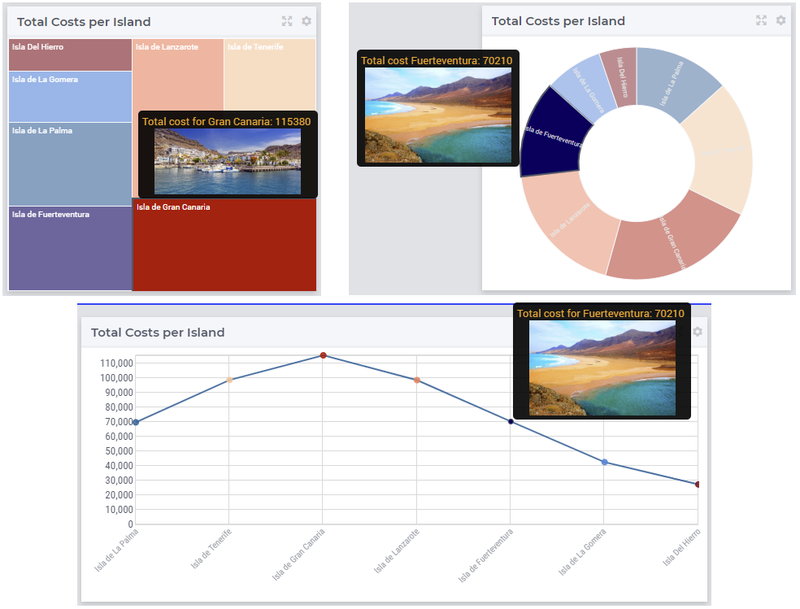 Users can still create new widgets for showing all available data. To avoid this, you need to adapt the set AllPublicIdentifiers, such that it only contains the identifiers that the current user is allowed to see. Furthermore, you need to make sure that users cannot edit the parameter that you specified for the Visible option (e.g. by giving it a definition). Change the Decimal Points option. The number of decimals displayed has a limit, the default is 2 decimals.